Join the discussion on our forums! Come discuss Crazed Worshipper over in our dedicated Crazed Worshipper discussion topic. Taunt. Whenever this minion takes damage, give your C'Thun +1/+1 (wherever it is). Every month they share a pancake breakfast with the Perfectly Rational Worshippers. Dont waste dust on this guy, just play your Druid of the Claw and Azure Drake 's, in your C'Thun Druid. This guy is very underwhelming. Already cut him from my warrior and druid c'thun decks. 800 dust to the bin, i feel ripped off. The worst thing about this is that blizzard made it a epic, so new players that want to make cheap c'thun deck will waste 800 dust on a Fen Creeper. Oh and Fen Creeper is a bad card for constructed if you don't know so i don't understand why this has so many positive votes. Is it just me, or is this guys accent awesome? I don't see people bringing it up that this can replace Sludge Belcher or Azure Drake in druid C'Thun as the second 5-drop druid always used in conjunction with Druid of the Claw. I don't know about warrior or priest C'Thun decks, but i'm 100% sure this'll find it's spot in druid. Actually, I think Druids are the class that have the least incentive to run this card. 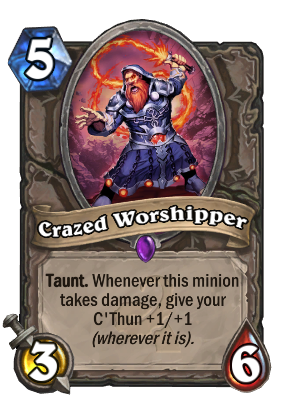 In C'thun decks already, there's just a lot more and better ways to give C'thun extra stats, that being said, adding a worse Druid of the Claw in your deck isn't the best way to go. I can certainly see this being played in C'thun Warrior if something like that ends up being a thing. Lol, you are not a druid but u must choose One here xd. You can not make a C'Thun AND a Patron deck that work at it's best. A warrior and prist C'Thun card. So this is basically the unofficial Warrior C'thun buff card. Preeety good. Fen Creeper for C'Thun. 3/6 stats are good for 4 mana and taunt 1 mana. So getting a single buff on C'Thun makes this card worth playing especially as a means to stall.